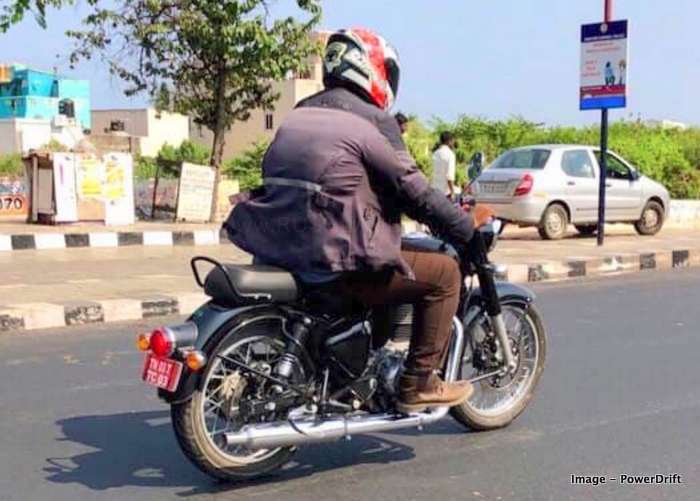 Home NEWS 2020 Royal Enfield Classic BS6 spotted on test, New Design? 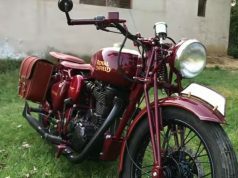 And now we have Royal Enfield Classic BS6 motorcycles on a test. 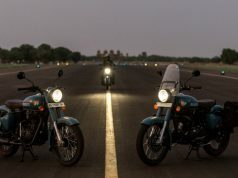 Last year, Royal Enfield reported that it is going to update their entire lineup of Bullet, classic as well as Thunderbird motorcycles with new-age technologies. The 350cc and 500cc engines will be updated to meet BS6 emission norms. 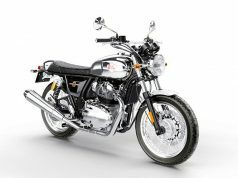 The company is planning to launch 12 new motorcycles powered by new engines. Now we got to see a Classic motorcycle with different looks. 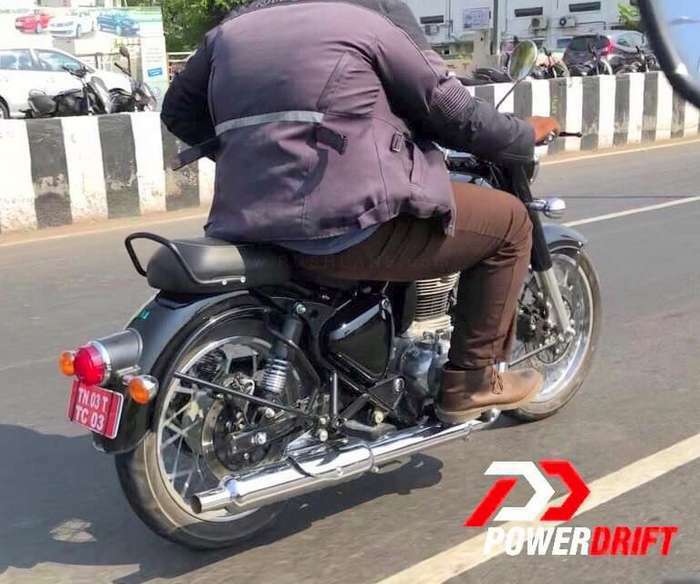 Folks at powerdrift spotted a Royal Enfield Classic BS6 motorcycle under test. From this angle, the motorcycle looked quite similar until taken a closer look. The red number plate says it all, that it’s a test ride bike. There are quite a few changes which we can pronounce at this moment. First of all, the exhaust muffler design is a little different. The heat shield is now longer and overlaps the rounded edge of the muffler. Secondly, the tail light, though looks the same, has LED lights instead of a conventional bulb. The tail light is encased in a barrel like thing with chrome bezel. Normal shock absorbers are used instead of Nitrox suspensions which are available in current gen bikes. But we think that this might be used only for testing purpose and final production bike will have nitrox shocks. One can easily spot the disc brake on the right side of the rear tyre. Currently, the disc brake sits on the left side and chain drive sits on the right side. Here on the test bike, the chain drive on the more conventional left side which made the disc brake setup to find its home on the right. 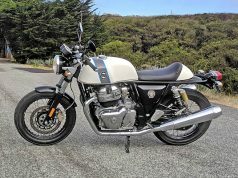 What I think is the bikes could be more refined than before. 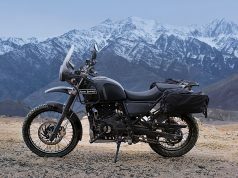 With the fuel injection system and new-age engine components, we can see a bump in power and torque figures for both 350cc and 500cc engines. 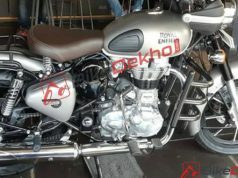 Speaking about the fuel efficiency, next generation Royal Enfield Classic BS6 motorcycles will return better mileage with fuel injection and BS6 norms. One thing which also caught our eyes is that there is no kick-start lever. This indicates the development of a new engine block and head. 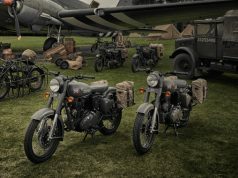 All in all, new Royal Enfield bikes will be better in every possible way as they have to counter newly launched Jawa motorcycles. Right now, the company sells around 40,000 units per month which might increase in the near future. 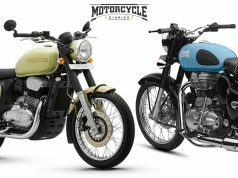 Jawa 42 vs Royal Enfield Classic 350, which one and why?